For all those events where a six-pack, or even a 12-pack, isn't enough, a Texas brewery will soon start selling a 99-pack of beer. 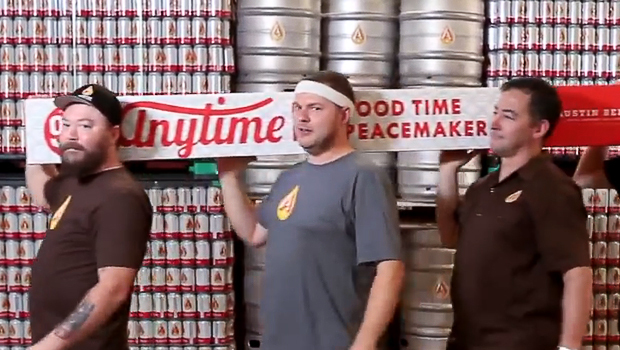 Austin Beerworks unveiled its 99-pack this week as part of a social media marketing campaign for its Peacemaker Anytime Ale. A video the company published on YouTube promises "99 beers for $99 bucks. Get 'em while you can. And good luck getting them home. You're going to need to bring a friend." The case is just over seven feet long. Sales of the initial run of 20 99-packs don't begin until Thursday in Austin, but news of the innovation has spread online, astounding the brewers over the public reaction. "We're a small brewer," said co-founder Michael Graham. "We only sell in our hometown. We're pretty amazed at how quickly it spread everywhere." "There's only about 20 [cases] to go around this weekend, but we'll be making more because apparently y'all like to party," the brewery posted on its Facebook page. The company will be posting photos of the sales on its social media pages so fans can watch customers attempt to make it home with the giant cases. "It's really impractical," said Graham, who expressed skepticism that customers would buy more than one 99-pack. "We conceived of it just to be silly, but we never thought there would be any real interest from retailers and consumers," he told CBS MoneyWatch. "I guess we underestimated the power of a stupid idea."